Concepción Navarrete was worried about her health. At 63, the mother of two adult children was pre-diabetic and had high blood pressure, but didn’t know what to do about it. She was eating the wrong foods. And although she was making attempts at exercising, it wasn’t making a difference. That all changed after her Zumba teacher told her about a new USC pilot study to determine if ¡Vivir Mi Vida!, a 16-week lifestyle intervention translated as “Live My Life!,” could benefit the health of rural, middle-age Latino adults. Fortunately, Navarrette was chosen as one of the study’s 40 participants. All were between the ages of 50 and 65, had accessed services from a local safety-net clinic within the past year and lived in and around Antelope Valley. While a particular health condition wasn’t required to be eligible, many participants were struggling with conditions ranging from depression to hypertension. Navarrete had a feeling her life was about to drastically change. Five years ago, a team of researchers from USC Chan began collaborating with various community partners, patients and stakeholders to develop ¡Vivir Mi Vida!, which was initially aimed at an urban-dwelling, senior demographic akin to the groundbreaking USC Well Elderly studies of the 1990s. It quickly turned into a community-driven, grassroots effort focused on rural, safety-net patients from minority groups. While Latinos in rural communities may be able to access basic medical and social care, specialized preventive services like occupational therapy are not commonplace. The Antelope Valley, located 60 miles north of Downtown Los Angeles, has the poorest health indicators in Los Angeles County including diabetes, obesity, heart failure and asthma. “When comparing the baseline health and well-being of our participants in this study to that of Well Elderly participants, you can see that this patient group was experiencing much more severe health problems at an earlier age,” Schepens Niemiec says. 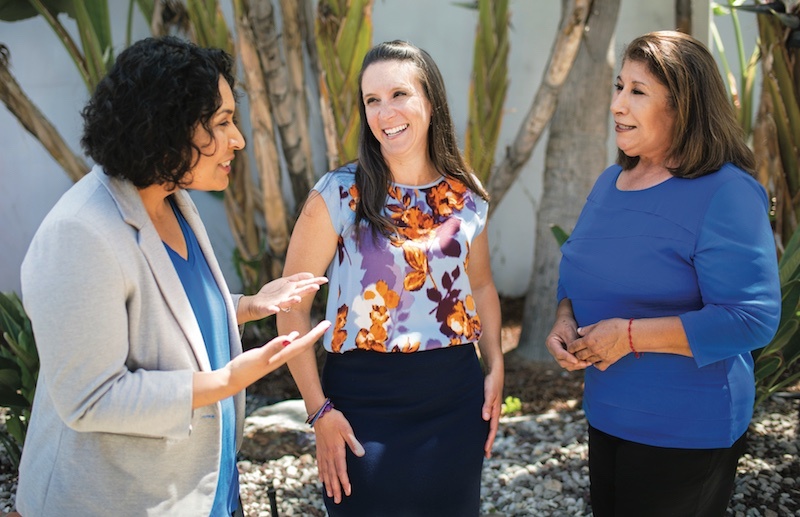 Schepens Niemiec led a multiethnic team with direct ties to the community, including three promotoras de salud — the Spanish term for community health workers — and additional staff from the Antelope Valley Community Clinic and Antelope Valley Partners for Health. A native of Mexico, promotora Laura Guzmán has decades of experience working in the community and a knack for connecting with people. Guzmán helped recruit all ¡Vivir Mi Vida! participants and spent a year, along with Assistant Clinical Professor Jenny Martínez ’09, MA ’10, OTD ’11, developing the program materials. Those included handouts, a picture-based flipchart and a loosely scripted manual, covering topics like healthy foods, exercise, specific health concerns such as diabetes, arthritis and cancer, and managing stressors like sleep and finances. Tailoring a culturally responsive study was more than just translating words into Spanish. The team was careful to consider the health beliefs and practices of the community. For instance, family is of paramount importance in Latino culture, and research shows that family cohesion is a significant health protective factor in Latinos. Thus, the program incorporated opportunities for family to be involved in their loved one’s health practices. Guzmán supervised two other community health workers as they delivered 16 weekly sessions, which were conducted more like a conversation between neighbors as opposed to a lecture in a class. Bits of educational content were followed by discussions about how it applied to participants’ daily life. Although the study was not a randomized controlled trial, its findings are incredibly encouraging. The negative impact of symptoms on daily activity significantly improved, even to a 12-month follow-up. Patients also showed improved clinical markers such as reduced systolic blood pressure, as well as improved health behaviors such as reduced sodium and saturated fat intake. These results — published in May’s issue of Primary Health Care Research & Development — will serve as a foundation for implementing a large-scale trial that will provide more definitive evidence about the value of such a program for late-midlife Latinos. 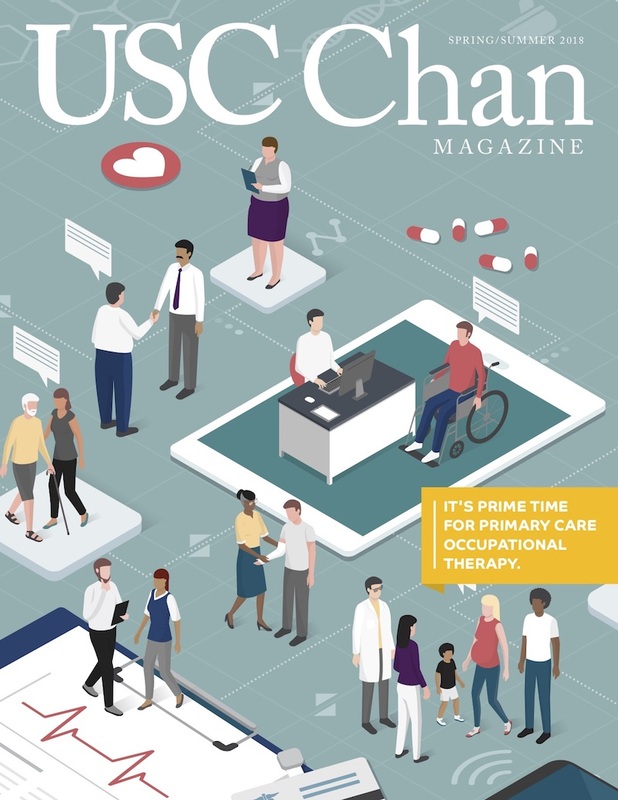 “It demonstrates the feasibility of extending occupational therapy services to underserved, hard-to-reach patients,” Schepens Niemiec says. As for Navarrete, she claims to be a reformed person. She’s become a pro at reading labels in the grocery store. Her cholesterol level dropped from 200 to 80. Her blood pressure is now a perfect 120/76 and she is still using the Fitbit she and all of the other study participants received, walking at least a mile-and-a-half every day. There was only one thing that she did not like about ¡Vivir Mi Vida!, however.